Waite, Head, Anderson, Klemke, Pillion, Peter, Carger, J. Evans, L. Ryan, I. Johnson, Inglis, Majok, Holliday, O. Johnson, Scott, Vassallo, Halkias, Fairlie, J. Ryan, J. Stevens, Lynch, L. Evans, Bottin. Nunan, Rankine, Eichner, Gutsche, Earl, Chamberlain, May, Baker, Crump, Walton, Inglis, Boots, Jones, Hay, Patterson, Gibson, Tierney, Laube, Kewell, Sinderberry, Smithson, Stidiford, Heitmann, Rana, Thilthorpe, Horstmann, Westley, Wright, Dunkin, Avery, Hannagan. Good luck to the Reserves tomorrow and let's get as many supporters to the game to cheer on the boys. Great effort from our U18s and despite the loss today they have a great season. With both the Reserves and U18s making finals this season it shows the depth we have with players. 2018 is a new season and with a new coach at the helm, together with recruiting and talented players stepping up from our Reserves and U18s.....we can look forward to on field success. In the meantime go Ressies!!! The Under 18's were dominated in the first half by a Sturt team that put great pressure on us and had several outdtanding players. 11 goals to 2 at half-time. With the pressure off a bit, we scored 8 goals to 5 in the second half, with Izac Rankine leading the way. Josh Smithson battled hard all day. We had a much younger side and there are several very talented players to watch for next season. Reserves with a great 31 pt win today .....well done guys!! 2018 looking good with our depth but we really do need to recruit a key forward in the off season. Quite a number of ressies showed today they are capable of stepping up next season and plenty to be excited about. The Development team controlled this game all day and should have put it out of reach in the 3rd quarter, but kicked 7 points in a row. Chol Majok rucked well & Lachie Ryan again got plenty of the footy, but the 2 younger standouts gave supporters a lot to look forward to. Isaac Johnson got a heap of the ball, while Patrick Fairlie, coming off 43 possessions in the 18's the week before, was outstanding. Smart player, league written all over him. Lots of other good players in a solid win. Well done to the Ressies on the win. Patrick Fairlie has played well in the Reserves all year. He has a strong body and he has been unlucky not to play league this year. He finds the football. Isaac Johnson played his best game for the ressies, his ball use is good and will only get better. Aaron Anderson was also very good his best game for the year. I thought he set the tone early on. 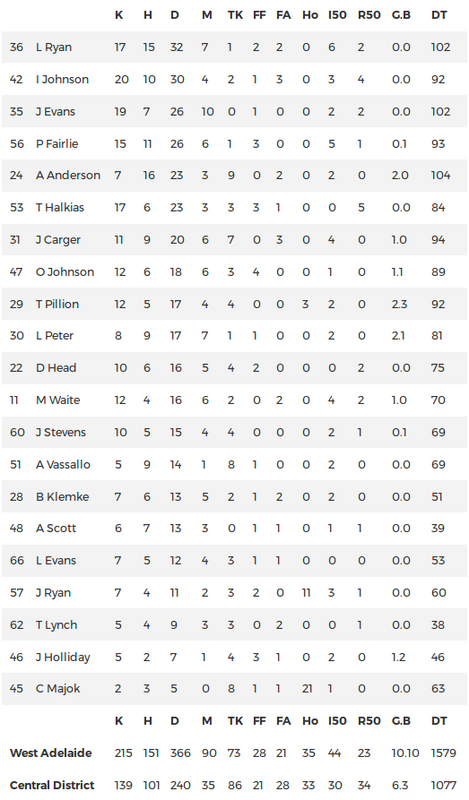 Stats from yesterdays reserves game v Central. And good to see that so many of our major ball winners are our kids. You have to love the way this team plays its footy. Great passion, teamwork and determination saw the Ressies get over the line and into a preliminary final against Port next week. WA 9.12, North 6.7. They hit the front mid way through the third Q and were never headed. In the end they won comfortably as they met every challenge North threw at them in the last Q. A 2 goal burst at the 6 minute mark, after North imploded, helped out without the ball going back to the centre and from then on it was tough defensive footy but played with great skill and flair. Suffice to say that there is a strong nucleus of players in the team that will play a lot of senior footy next year. Interesting to see if they can convince the coach to apply for the senior job but timing is not good for him. Pity, he deserves the chance. Majok injured himself in a magnificent spoiling effort in the last Q and captain Scott went off late in the last with, what looked like a knee and a hammy to go with his injured hand. Hopefully they will be playing next week as they both perform key team roles. Magnificent effort from the Reserves and here's hoping the boys can go all the way. The way they are playing at present they have all the momentum to carry them through. Waite, Head, Anderson, Klemke, Pillion, Peter, Carger, J. Evans, L. Ryan, Dunkin, I. Johnson, Inglis, Majok, Holliday, O. Johnson, Vassallo, Halkias, Fairlie, J. Ryan, J. Stevens, Lynch, L. Evans, Bottin. Just more win next week... Go you bloods! Well done to the Ressies on a good win today. I like the way Aaron Anderson goes about his footy. half back in the league side. Wow! The Ressies are into the Grand Final next week. Not only do they deserve to be there but, based on their current form, they have to be a good chance of taking out the flag. That may sound a little cocky but to see them demolish Port at Richmond today their confidence must be high. Port didn’t kick a goal in the first half. We had 8 goals at half time but dominated the play and probably should have had at least 12 on the board. Port came out after half time and threw everything at the boys but they withstood the challenge and matched them goalwise for the Q. The last was a procession as we banged on 6 goals to their 1. Final score, WA 17.11, Port 4.12. Rarely did Port have an easy kick. We tackled brilliantly and harassed them into error all day. We would work to create the breakaway and kick to an open forward line where we had some strong marking options like Peter and Pillion. Waite arguably our best player. Stevens with 11 tackles, Anderson and Carger prominent in a very even team effort. Well done to all concerned and good luck for the big one next week. Terrific win. I thought our first half was as good as I've seen a West Reserves team play.